It was one of our greatest manager’s Ron Greenwood, who when asked what the club’s footballing philosophy was replied: “Football is a game of intelligence and beauty, that’s what we try to deliver at West Ham. If the crowds go home with smiles on their faces, having jumped up out of their seats at least six times, and hungry for more. I feel I have delivered” It was during Greenwood’s period at the club that The Club gained its reputation of being The Academy of Football. Stylish inventive football, football on the deck. At same time bringing through talented youth from The Club’s Academy. So it’s no surprise that West Ham fans have always had a special place in their hearts for flair players. Players who could create something out of nothing. The likes of Trevor Brooking, Paolo Di Canio or one of my big favourites, Yossi Benayoun. In fact till recently try as might, we never managed to replace the mericual Israeli. But as they say in life every cloud has a silver lining .Upon taking over the managerial reigns at West Ham, Slaven Bilic sat down with the Owners to discuss transfer targets. He requested two creative midfielders, they did deliver…spectacularly as it turns out. 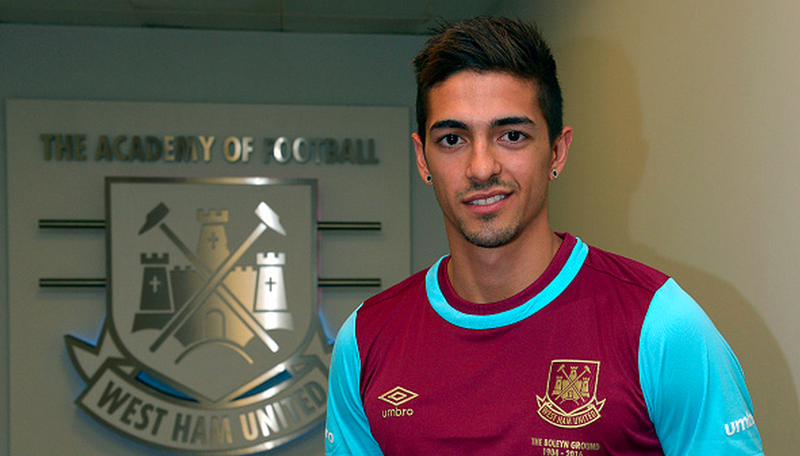 When the Club initially signed Lanzini, I was hopeful more than anything else. I had heard what Tim Vickery, the South American football expert had said that was a “skilful little playmaker who might be too light for the Premier League “The cynical part of me said; “God! Yet another Barry Silkman bum of the month! Doesn’t Sullivan ever learn! “To be fair we have signed a whole host of South American bum of the month’s .Added to that his parent club Al Zazira was hardly one of the great club’s in world football. How wrong I was! Manuel Lanzini is a great talent and most certainly our little magician, even in a poor season like this he was shone. All the good things that have happened on the pitch, have involved Lanzini. In fact he has grown in stature since Payet departed. His leap into the crowd when he scored in the next game after Payet’s departure, had the hallmark of: “Yes! I’m your main man now! Lanzini is wasted out wide he must be deployed in the classical no ten role or the old style playmaker. Capable of quick one –two’s, beating his man and leaving him for dead, capable of spectacular goal’s. Always playing his football with a smile on his face. Scorer of some spectacular goals, my favourite being his goal against Chelsea last season. I have noticed that he is starting to develop a good understanding on the pitch with Andrew Ayew, given time the understanding will become even better. Enabling them to open the opposition up with ease. With our man Manuel ‘The Jewel’ Lanzini, able to float like a butterfly sting like a bee, and at 24 is only going to get better. Despite this season’s perils on and off the pitch, better days lay ahead. For the first time in decades we have some really promising youth coming through. No more excuses, if’s or but’s. The Board simply has to deliver and replace quantity with quality. Do that and The Jewel will light up The London Stadium and this seasons perils will be designated where they belong. History, we are more than a football club, we’re a way of life! accurate analysis of a quality player; you are right about Payet too. Sadly our manager seems determined to stick these players out wide. Lanzini is a different proposition in the middle and so was payet. Spot on we need him in the middle ! !